West Virginia has the highest adult obesity rate in the nation, and the seventh highest obesity rate for youth ages 10 to 17. 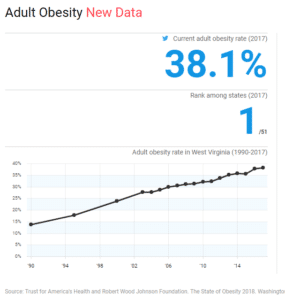 West Virginia’s adult obesity rate is currently 38.1%, up from 23.9% in 2000 and from 13.7% in 1990. 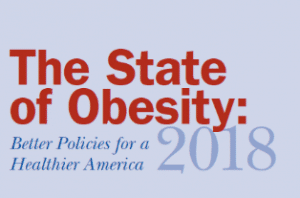 This state profile includes data on adult and childhood obesity, obesity-related health issues, and policy actions West Virginia is taking to prevent and reduce obesity. According to the most recent data, adult obesity rates now exceed 35% in seven states, 30% in 29 states and 25% in 48 states. Click here for FULL report of West Virginia. View adult obesity rates for all states. This report was released on September 13, 2018. The 12th Annual Southern Obesity Summit is meeting in Charleston, WV on October 22-24, 2018. Click here to register for the Summmit.